I was recently preparing a 20-minute keynote speech for a client. A draft was printed and sitting out on our dining room table at home. My daughter, a senior in high school, picked it up and started reading it. A couple of paragraphs in, she looked up and asked who wrote it. I said I did. I told her of course not, the speech wasn’t for me. I was writing for someone else. Why, indeed! Not a surprising question, coming from someone who is a good writer, I guess. But an interesting one. Because writing is hard, I told her. And writing for public speaking? Even harder. That’s why we have professional speech writers. But her question got me thinking. What if you aren’t a writer, but you find yourself having to give a speech and hiring a writer to do it for you isn’t an option? I thought I would offer some helpful hints for those who find themselves having to do this on their own. It may seem like a daunting task, but there are ways to make the process a little less painful – I promise! Hopefully, you’ve been given ample amounts of time before you’re expected to speak. Regardless, whether it’s four months, four weeks or four days (hopefully not! ), start the process now. Speeches take time to develop, write and PRACTICE. Don’t wait until the last minute; preparation is key to a successful and engaging speech. What do the event hosts or planners want you to talk about? Knowing this will help guide your speech if you start to get off track as you’re writing (and you will). Who is the audience? Of course, this will depend on your industry or expertise, but it could range from educators to businesspeople, as in the case of my client. These are two vastly different audiences with different expectations, life experiences and perspectives. You need to find a way to relate to your audiences and talk about things that are interesting to them. What is the agenda? You’ll want to find out who is speaking before and after you, if there are several speakers. If you are doing a keynote, who is introducing you and at what point in the event are you speaking? If you know the other speakers, ask them what they will be talking about ahead of time, especially if you work in the same circles. You don’t want half your speech already covered by another speaker. How many people are they expecting at this event? Is it 500 people or 50? This will make a difference if you are using audio-visual (AV) aids and it will set the tone for your speech. What kind of AV set up will they have? If you plan to use any AV aids, plan to go early the day you’re speaking to test it – or, a few days before, if you can. Don’t be afraid to find out everything you can about the event – the more you know, the better prepared you will be. Decide on an end goal. My client was asked to deliver a keynote for a business event. 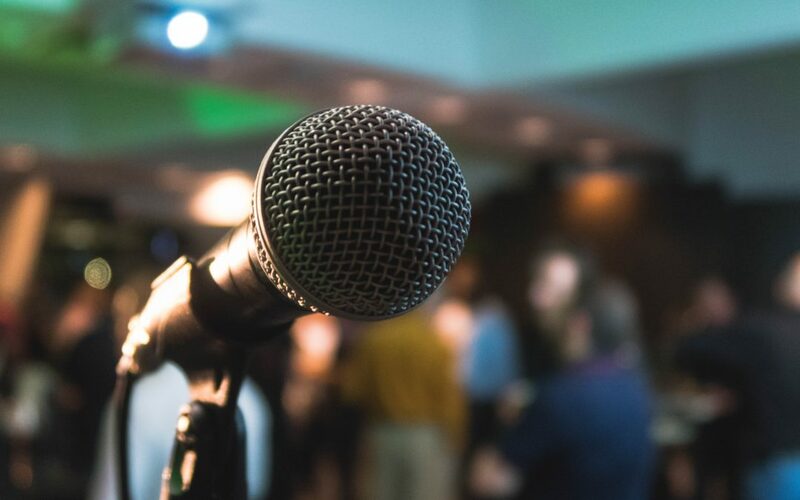 We knew that after the speech, we wanted the audience to walk away knowing a little more about him (as a fairly recently named CEO of a new organization in town), about the organization (and who it helps), and how they, the audience members, can get involved. This speech was written to meet these end goals – and yours should do the same. Before you write a single word, decide what you want your audience to walk away with. Ask yourself: why are you delivering it? And don’t say because they asked you to. You’ve been given an opportunity to share your message and your mission with a captive audience – take advantage. It may even help to write your end first, so that everything you write after will be with your goals in mind. Map out your speech before writing. Make an outline with time allocated for each section. This will get you organized and will help make the task seem a little less daunting by putting it into small bits vs. one big, long speech. Don’t think of it as a 20-minute speech; it’s five, four-minute sections. I know, this is a lot harder than it sounds. But if you’re using the words and language you use in everyday speech, it will sound natural and it will be easier for you to remember and deliver. A great exercise is to record yourself. Sit down with a friend or colleague and have them interview you. Later, listen to how you answered, and how you talk…this is the base, as well as general tone and language, you’ll use for your speech. Sprinkle your speech with stories and anecdotes. People love them because it breaks it up, may even make them laugh and shows that you’re human. If you can relate to your audience through shared experiences, they will be more engaged. Ask a colleague, family member or friend to read your speech, while you’re still in draft. Get someone else’s outside opinion before you get too far into the weeds or you’re too close to the event to make significant edits. Ask them if you achieved your goals by the end of the speech and if it made sense. As someone who knows you, they will offer feedback and may also think of something you’re missing. AV can be a great way to add character to a speech and to break it up into chunks, especially for long speeches, but don’t use it as a crutch. There’s nothing worse than a speaker who presents an entire speech in 50 PowerPoint slides with bullets. However, a cool video or a handful of interesting photos placed at just the right moment for emphasis can be very effective. Practicing is part of the writing process. As you practice your speech, you will make tweaks until you have a final version. Practice on your own; practice in front of people and practice with your AV aids. Record yourself and watch it. Your audience will be able to tell if you waited until the last minute. The more you read your speech, the more natural you will sound. You’ll learn what is coming next and you’ll be able to look up and interact with the audience. Not everyone is a natural speaker and that’s perfectly fine. You can be an inexperienced speaker, but there’s nothing worse than an unprepared speaker. Public speaking is no joke – it is terrifying for folks. But, a well-written, conversational and well-rehearsed speech will help make it that much easier. Try not to think of it as a burden, but an opportunity. Remember that you have a reason for speaking – your mission and your message. Email us at [email protected] for more information on our writing and consulting services.